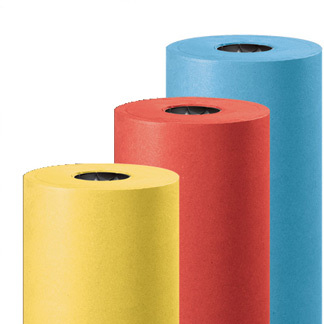 Vibrant Yellow, Red and Blue Kraft Paper is available in heavy 50# weight kraft. Colored Kraft Paper is tear and puncture resilient. One side smooth and accepts felt pens nicely for drawing, the other side has a textured surface to take on paints and chalk. Approximately 1000' on each of these colored Kraft paper rolls. FOB IL. Allow 48 hours to ship. Blue Kraft wrapping paper, Yellow kraft paper, Red Kraft, PaperPapel de embalaje kraft amarillo, azul Kraft papel de regalo y Red Kraft papel de envolver.